Rosemary Longhurst: Is Australia afraid? "More than 500 people packed into a forum at the University of Western Australia on Friday 4th November 2005 to express their fears and anger at the government and its proposed anti terrorism legislation. The distrust of government both federal and state was palpable. Emotions ran high at the failure of the Labor opposition to oppose this appalling threatening legislation, with disbelief expressed that this could be happening in this country of ours." "There were calls for Federal Labor to oppose the Bill in both the House of Representatives and the Senate. The WA State Labor government should not cooperate on the implementation of such "draconian legislation." The Perth forum was addressed by Carmen Lawrence, Federal Labor Member for Fremantle, Rachel Siewert, Greens WA Senator, and Mark Cox, a human rights lawyer. Below is the address to the forum by Rosemary Longhurst, who spoke on behalf of the WA Council of Churches. This page contains the presentation by Ms Rosemary Longhurst, speaking at the Forum on behalf of the Australian Council of Churches, and it includes a formal statement from the Religious Society of Friends - better known as The Quakers. Rosemary Longhurst is a member of the Quakers' society. Terrorism home page: Home of Terror? Does Aus need a Bill of Rights? 17 November 2005: Will you Cross The Floor, Senator? - an unexpected window of opportunity has appeared, small, but significant. While Parliament was planning to rush these laws through, delays caused by the Industrial Regulations Bills postposed the debate and the voting for the Terror laws in the lower house. 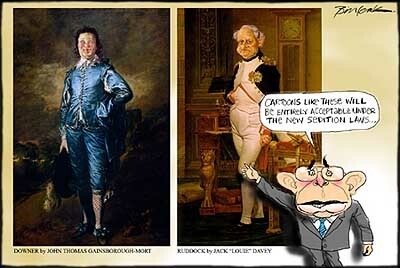 12 November 2005: Of Treason and Sedition - Stop acting like an artist, and especially, stop critiquing Australian society if that includes the Howard government. You may be accused of treason or sedition. Some people already are, in underhand communication coming from the Prime Minister's office. 10 November 2005: Decent Liberals and their terror fears - two of the most interesting speeches in Parliament this week, and they're both from the government bench -from two Liberal party members, Petro Georgiou MP, and Steven Ciobo MP. 9 November 2005: The terror laws: What you can do - This page is a web-page copy of the Anti-terrorism Legislation Action Kit distributed throughout the networks shortly after the Perth Forum. The Kit is also downloadable from this page as a PDF File. 4 Nov 2005 Perth Forum: Senator Rachel Siewert: Terror Australis - within the space of a few short months we are now experiencing a fundamental erosion of our democracy and the Australian way of life. The scope of this change is so large it is almost difficult to comprehend, and it is occurring across a front so wide that effective opposition seems to be stymied. 4 Nov 2005 Perth Forum: Michael Sinclair-Jones: Risking a Totalitarian State - My union believes the penalty aims to silence journalists, intimidate them into submission, and will allow miscarriages of justice to go unquestioned and - inevitably - unnoticed. 1 November 2005: When the Terrorist Strikes - Resources for Anti-Terror Bill dissenters - You may need to consider how you will have to publicly declare your hand of overt dissent ... if these laws stand as they are at the moment you may need to consider whether in your life a case exists for undermining these laws. I am a Quaker, a member of the Religious Society of Friends, and I currently represent Friends in the WA Heads of Churches group. At a recent Heads of Churches meeting I raised concerns about the Federal Government's proposed anti-terrorism legislation and was asked to take these concerns to a General Meeting of the WA Council of Churches. I therefore prepared a brief public statement for discussion. The General Meeting added a sentence to acknowledge the difficulty of the government's position and authorised the release of the agreed statement. It is as a result of this discussion that I have been asked to speak to you tonight to express the churches' deep concerns about the proposed laws. Our specific concerns refer to many of the legal and political issues which have already been covered by other speakers, so I will focus instead on the moral and social implications of the legislation. We are concerned that this package of legislation conveys to the world that Australia is afraid - indicating to the terrorists that they are achieving their aim of generating terror and forcing governments into ever more punitive stances. How can we defeat terrorist argument that desperate measures are needed to achieve goals, i.e. that ends justify means, when our government itself adopts desperate measures and justifies the means in terms of ends? We expect any government to do all it can to ensure our security; but the means by which that is done conveys to the world the nature of our society and the values by which we live. Tipping the always precarious balance between security and freedom in favour of security runs the risk of destroying the very way of life - the essential Australian 'fair go' - that our government is supposed to be protecting from terrorism. As a Quaker, I am committed to building a peaceful and just world and to valuing everyone as a child of God. I believe that a similar commitment is shared by most people of faith. Recognising 'that of God' in every person, even where we may disagree, acknowledges our common humanity and respects the rights and responsibilities of being human. In conscience, we cannot support any legislation where these fundamental rights are challenged. The proposed anti-terrorism laws breach a range of international human rights laws, conventions and treaty obligations - as demonstrated by other speakers. Churches have a moral duty to "Speak Truth to Power" - to bring rulers to account - when they perceive an erosion of the core values that underpin Australian society. Under the new laws of sedition, we may no longer be able to fulfil this historic duty without committing illegal acts. This is not only a matter for Heads of Churches - many clerics have expressed real worries about what can be said from any pulpit once the laws are in place. During wars and civil unrest, churches have always done much to relieve the suffering of ordinary people on all sides, but it is hard to see how such ministry would be possible under the proposed laws, which prohibit giving assistance to terrorists or enemies of Australia, especially when there is only a vague definition of who or what constitutes a 'terrorist' or an 'enemy of Australia' [Note 3]. It is even possible that prayers for all who are suffering in areas of conflict around the world - ordinary citizens in Iraq, for instance - could be interpreted as seditious. In the event of a terrorist attack on Australian soil, the Churches would have a moral duty to minister to all who are injured or otherwise affected and in the context of such suffering cannot be expected to discriminate between innocent victims and potential terrorists. Would words of comfort or prayers for a dying man or grieving family have to be refused in case they turn out to be perpetrators? Churches have long provided ministry to prisoners and their families, but secrecy provisions expressly prevent this for anyone apprehended under the terms of this legislation. Churches are concerned that this legislation may be applied in a discriminatory fashion. Minority and vulnerable groups are likely to be especially affected, breeding disaffection from mainstream society. Muslim groups already feel targeted & this sort of alienation is currently generating extensive civil unrest in France and in other parts of Europe where there is a sizeable Muslim population and high unemployment. Groups of people who have nothing to lose always pose a threat to civic order so in Australia the potential for escalation of ethnic gang violence or major riots may well be greater than the likelihood of terrorist attack. We are also concerned about the lack of accountability and transparency in these provisions. History shows that in many regimes where secret services and others carried out arrests and questioning without transparent supervision, they became corrupted by their uninhibited powers. There are concerns about the application of preventative detention because there is no obligation on the AFP to provide a detained person or their lawyer with the reasons, information or material upon which a preventative detention order was made: (section 105.28.) This makes it exceedingly difficult for a person who claims they have been wrongfully detained to seek redress. The lack of scrutiny and obligation to secrecy surrounding such detention orders means that errors such as mistaken identity or inaccurate intelligence are highly unlikely to be identified or acknowledged, with the result that innocent people will be caught up in the dragnet, as we have seen occurring in the application of immigration laws. Add to this the potential for abuse of process in applying the legislation (eg stretching the notion of 'appropriate force') and innocent members of targeted ethnic groups have real reason to fear apprehension or harassment. There is a danger that such situations will erode respect for the rule of law in ethnic communities, and individuals who claim they have been mistreated may come to be seen as martyrs. We have particular concern for minors under 18 and the mentally ill because the legislation as presently drafted does not allow them to have anyone present to advocate on their behalf, though they cannot legally speak for themselves. There are concerns about the application of control orders when all that needs to be shown is that an AFP officer has a reasonable suspicion. A control order might mean home detention with no social contact for a year, so it is worrying that such a low standard of proof is required. The effect of these measures on families is also a cause for concern. Apart from long-term psychological trauma from violent police raids, secrecy requirements mean that unsuspecting partners and children will suffer from lack of information or assumption of guilt by association, as well as significant financial hardships if a family breadwinner is apprehended. Ostracisation of families and suspects due to community fear of guilt by association could make it virtually impossible for the family to return to normal life even where a suspect has been shown to be innocent of wrongdoing. Most of all we are concerned about the climate of fear that is being engendered in Australian society. There appears to be little realistic basis for public fear. The threat of global terrorism is less than that of global poverty and disease in terms of lives claimed and societies destabilised. A Human Security Report, written by academics led by Australian Andrew Mack, of the University of British Columbia, cites popular notions that war is becoming more common and deadlier, that genocide is rising and that terrorism poses the greatest threat to humanity, and concludes that. "Not one of these claims is based on reliable data," (from Daily Telegraph report, 19th October 2005) The report notes that UN peacekeeping operations have reduced global conflict and calls for a sustained and strengthened commitment to conflict prevention and peace-building. Terrorism is not a new phenomenon; it has a long history and has been used in support of many causes in many countries. It is therefore at least unclear why extraordinary powers are now required [Note 4]. There are already laws that give powers to authorities in relation to threats or acts of violence against the community. It is hard to understand the need for even more powers when it seems the existing ones are more than sufficient. The proposed anti-terrorism measures are responding to and encouraging irrational fears of unseen evil in our midst, creating a society in which no-one can be trusted. Citizens are being encouraged to inform on their neighbours and associates, while a focus on security and border protection builds a 'fortress mentality', in which human connectedness cannot flourish. When daily life is lived in permanent crisis mode, deeper reflection and realistic assessment of danger are sidelined. This legislation relies upon the belief that in a crisis due process, fairness and evidence may be seen as irrelevant or minimal compared with the need for protection of self and loved ones. The doctrine of 'pre-emptive strike' is thus being extended into the social sphere, bypassing requirements for proof of guilt. But this is the moral equivalent of the lynch mob. Once accepted in principle, where does it lead? When fear and distrust engender the justification of bad actions, distinctions are gradually blurred between justified action and right action. This is a 'slippery slope' whereby ordinary people become capable of accepting or committing terrible injustice (as occurred in the Holocaust) Ultimately, aggression becomes justified against any perceived threat, however vague or ill-founded., and this is no different from any vigilante action that pre-empts the due processes of the rule of law, ultimately leading to a breakdown of civil society. Terrorists think this way; we should not compound suffering by falling into the same error. If mere suspicion of evil intent is to be an adequate rationale for punishing individuals, then our situation becomes comparable to the 17th century witch-hunts in which millions of innocent people suffered. Characterising terrorists and their supporters as inhuman monsters, or somehow less than human, leads to justification for degradation & torture, which the churches could never condone. Events at Abu Ghraib and claims of inhumane treatment at Guantanamo Bay and other 'outsourced' locations show that the public demonisation of detainees is already affecting those who implement this detention. Surely it is the responsibility of government to contain public over-reaction, not to foster it? Every Australian has the right to live in peace and security, but fundamental principles are being threatened when the need for security is held to be more important than the equality of all under the rule of law. These fundamental principles are not only legal and political, they articulate the values that bind us together as a society - equality, fairness, mutual respect, tolerance and trust. Those values are our social capital, and once that social capital is squandered it will be very difficult to regain. Every piece of new legislation and each amendment to old legislation that diminishes trust in one another and the value we place on the life of every human being is a step toward alienation and spiritual numbness. The Churches are thus gravely concerned that the enactment of these laws will be counter-productive, undermining the values that bind us together rather than connecting us more closely against a perceived enemy or enemies. Governments and legislation cannot guarantee security. There is no ultimate protection from life, because being human means being vulnerable. Being fully alive means being open to experience, of pain as well as pleasure, and. all people of faith know this if they are genuinely open to God. And it is precisely in moments of greatest vulnerability that we can be opened to a greater understanding. "... we have known that safety cannot be defended in our own strength, but only in God's... And we don't have to do it with tools of our own fashioning, ever more elaborate technological juggling acts, ever more devastatingly destructive bombs... [We can] learn to lay down carnal weapons, practising with weapons of the spirit: love, truth-saying, nonviolence, the good news of God's birth and rebirth among us, imagination, vision and laughter. WA Council of Churches public statement: This statement has now been released and is available on the CCWA website www.churcheswa.com.au. Bill of Rights: The US Patriot Act is subject to rights protection enshrined in the US Constitution, while the UK's anti-terrorism legislation is subject to the 1998 enactment in British law of an E.U. code of rights. Sedition and assistance to enemies of Australia: In both World Wars, Quaker conscientious objectors served in the front lines in the Friends Ambulance Unit, helping to relieve suffering on both sides. This kind of assistance appears to be prohibited under the proposed legislation. Quotation: Mary Lou Leavitt, 1987 (Quaker Faith & Practice, Britain Yearly Meeting, 1993, section 24.55). The reference to Deuteronomy is to Moses at the end of his life, speaking to the Hebrews. The way to security is through trust and trustful relationships. We believe that the Anti-Terrorism Legislation breeds mistrust and insecurity. While we appreciate that there is a tension between public safety and individual civil liberties, we question whether the likelihood of terrorism justifies the loss of democratic rights. We appreciate that in the event of a terrorist act, governments need to be seen to have done all they could have to prevent it. However, many of the 'terrorist acts' we have witnessed have been small, local and using low scale technology. It is unlikely that this, or any other, legislation will protect us from these kinds of acts. When the focus is on fear and terror the balance between security and civil rights is tipped. We wish to redress this imbalance. We must all work to ensure that this legislation will not be enacted at the cost of the breakdown of trust in our community. We ... actively oppose all that leads to violence among people and nations. Refusal to fight with weapons is not surrender. We are not passive when threatened by the greedy, the cruel, the tyrant, the unjust. We must start with our own hearts and minds ... The places to begin acquiring the skills and maturity and generosity to avoid or to resolve conflicts are in our own homes, our personal relationships, our schools, our workplaces, and wherever decisions are made. What we advocate is not uniquely Quaker but human and, we believe, the will of God. Our stand does not belong to Friends alone - it is yours by birthright. Together, let us reject the clamour of fear and listen to the whisperings of hope.